This post is in partnership with Worldcrunch, a new global news site that translates stories of note in foreign languages into English. The article below was originally published in Le Monde. ÉVRY  On a recent Friday evening, Maroua Gousa is standing behind the latticed wooden partition in the section of an Évry mosque reserved for women, watching a presentation projected onto a screen below in the large prayer hall for men. Fond of exploring religious ideas and practices, the 19-year-old student is taking part in a debate with 200 other participants in this city just south of Paris. The gathering is actually the most recent installment of a new attack aimed at the science of evolution led by Harun Yahya, an outspoken Turkish-born Muslim advocate of creationism who is considered widely controversial within the Islamic world. 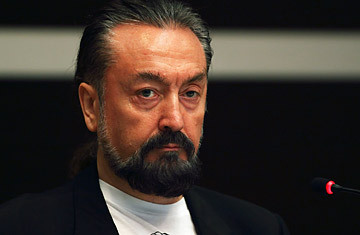 Harun Yahya, the pseudonym of Adnan Oktar, never presents himself in person, speaking either by video or through zealous representatives armed with grandiloquent tracts distributed for free. In France, he made himself known in 2007 when he attempted to introduce thousands of copies of his Atlas of Creation into French schools. His work purports to scientifically demonstrate "the frauds and dictatorship" of the evolution-of-species theory. But since January, the 55-year-old with a well-trimmed beard has launched a new campaign that is clearly targeting the Muslim faithful. Gousa, dressed in a traditional black robe decorated with rhinestones and a white veil that she wears only when she comes to the mosque, admits she has always wondered about "the dinosaurs and the origin of man ... but at school, it cannot be refuted: we're taught that man descended from monkeys. At home and in the Koran, [we're taught] that we descended from Adam and Eve, and that God created all living beings." Based on this fact, Engin jokes about "frogs transformed into princes." He insists that a "Muslim cannot be a Darwinist." Yahya himself has promised $7 million to anyone who brings him a fossil from one of the transitional species. The scientific content of these works by someone who has studied only art and philosophy in Istanbul was judged to be of "pathetically poor quality" by French academics appointed in 2007 by the Education Ministry to evaluate Atlas of Creation. Yahya's methods are nevertheless known to be as effective as those used by American Evangelicals, and he isn't afraid to shock participants. Engin invoked Hitler and 9/11 in order to declare that "all Darwinists are not terrorists, but all terrorists are Darwinists." The discussion on the origins of life appears to hit its target in the audience, a mixture of "mainline" believers and devout fundamentalists. Amadou Bah, a 26-year-old student of finance, is happy to have these "clarifications." "Like all Muslims, I am a believer in the theory of creation, but I didn't have arguments to defend it," she says. "At school, we believed the teachers, but here their theses are disproved," adds Yanina Gelassi, a 19-year-old student veiled in black. "They don't have the truth." Nouri Hamid, 28, a doctoral student in genetics, is not "totally in agreement that there is a complete lack [of evidence] for the evolution of species," but he also says that "science has never demonstrated the connection between Homo sapiens and man." Similarly, the "concordist" approach to the Koran, defended by the conference speakers, is popular among young Muslims. This concept states that the recent scientific discoveries only confirm the scientific content of the sacred book. "This proves to us that, despite all of the research, God said and wrote everything down in the Koran nearly 1,400 years ago," says Najoua Oubaya, a 21-year-old saleswoman. "These discussions are good for the people because they prove that the West has discovered nothing and that Islam is superior, even scientifically," wrote Nidhal Guessoum, a Muslim astrophysicist, in Le Monde in 2009. The author of Réconcilier l'Islam et la science moderne: l'esprit d'Averroès (Reconciling Islam and Modern Science: The Spirit of Averroes), he describes Yahya's methods as "do it yourself," and defends the search for connections between science and faith as the same as what has been done in Christianity. In 1996, Pope John Paul II confirmed that the theory of evolution was "more than a hypothesis," but the Catholic Church maintains that science is not the sole contributor to the explanation of the origin of life, as Pope Benedict XVI recalled in 2007. "The scientific manipulations of Harun Yahya are alarming for the Muslim community," says Saïd Branine, who runs the site Oumma.com and organized a training program on the topic. Branine said he is worried by the lack of reflection among Muslims about the relationship between science and religion. "Creation is subject to faith, and many fear that by questioning this belief, they question the cause of their faith as well," he said. "This demonstrates the need to train Muslim intellectuals. All the more so because Yahya has abundant resources." The source of the funds that support Yahya's Science Research Foundation remains a well-kept secret. Silvio Berlusconi: Is the Magic Gone? See "The Politics of Women's Head Coverings."